7 – 8.30 pm: third of a bottle of Rioja (admittedly a joven which had barely been kissed by the oak barrel) in the highly recommended Verdo’s. In other words, not nearly enough to see psychedelic goblins jumping from the guitar strings as Richard Thompson played: on the other hand, probably about the same if not more than most of the rest of the audience. Although there may have been a bit of Warfarin, some Digoxin, and maybe some beta blockers, going round. Without being unkind, it’s an unusual gig these days where I’m bringing the average age down, but I sure was on Saturday night. I only mention this really because the Queen’s Hall is a funny old place for a rock gig. It’s small enough to be intimate: and yet, somehow, it still has the feel of a dowager aunt that doesn’t quite approve of all this loud stuff and would really rather get back to some chamber music with oh, I don’t know, that lovely Nicola Benedetti playing lead violin. Of course, bear in mind that your blog had gone on a waiting list, more in hope than expectation, and had got a phone call just that afternoon with the offer of restricted view tickets. I had joked with the others that we would get a really great view of the bass player and nothing else: something which turned out to be uncannily prophetic had we stayed in our seats, as you could only see the right hand side of the stage, and that was assuredly not where Richard T was at any point, having tucked away in the left hand corner. The bass player had a fetching hat that was somewhere between a pork pie and a trilby, but hats aren’t everything, at least not for me. If you find yourself in the same situation at the QH, the best solution is to get up and go and stand at the rail along on the far left hand side, from where we had a much better – if restricted – view of Richard’s beret, his guitar, and, when they weren’t moving in a total blur, his hands. Back to the audience, though. It’s probably just as well that they were of the, well, more mature variety, and sat doucely in the stalls throughout the performance: the stage is pretty much at ground level, so wild outbreaks of dancing and rushing the stage to fawn over RT would be pretty difficult to police. And my mate Harky, who works there, and tipped us off about the gig (thanks, Harkster!) is only a wee lad. Even he would struggle to charm a houseful of teenage indie fans back to their seats. And so to the gig. 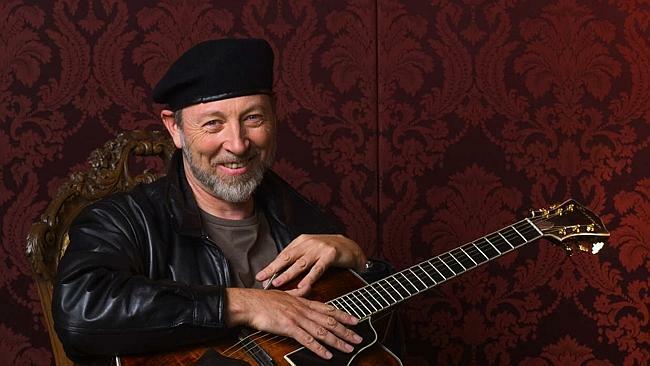 I’m afraid Richard Thompson is another of those names that I’d always heard of, without really listening to. This immediately puts this review at a disadvantage to one written by a deep-dyed aficionado who has lived, breathed, and indeed worn a similar beret to, your man for the last forty years or so. So don’t expect a detailed analysis of how he played, (as he did (1)) for example, ‘For Shame of Doing Wrong’ differently from when he and Linda were together, or how ‘Meet on the Ledge’ got a different treatment altogether from the Fairports. This won’t be that kind of review. The advantage, if there is one, is that your blog was coming at the whole Richard Thompson shemozzle entirely fresh, with no preconceptions of what he’d be like, or whether, in fact, the Fairport Convention/Linda and him version of anything was better. I literally had no recollection of hearing a single RT song all the way through before Saturday night: I sometimes wonder just what, and who, I have been listening to through all these years, apart from far too much Dylan back in the day, as I’ve already confessed to. All I could have told a visiting Martian about Richard Thompson (should said Martian have eschewed the usual opening banter of taking him/her to my leader – now there would be an interesting question) was that he had been something to do with Fairport Convention, he had had a wife called Linda but they had split up at some point I thought; they had kids who were also now musicians in their own right; and he wore quite a cool beret affair in pretty much every image I’d ever seen of him. And that he was somewhere between a cult figure and a Serious Rock God, and was rumoured to play guitar a bit. A bit. Oh. My. Actual. Dog. Did I say he can play a bit? He nearly made a mere mortal want to give up playing guitar then and there, except this was so good it almost wasn’t something called guitar playing. It was like a thing you did with a guitar that was above and beyond guitar playing, what another recent review called a ‘mad emotional algorithm’ pouring out of the Stratocaster (he stuck pretty much to the Strat, from my restricted view, guitar fans, although he switched to a Telecaster for the final number in the set proper, ‘If Love Whispers Your Name,’ of which more later). I’m pretty sure that, had I been on something stronger than aforementioned sensible modicums of artisan roast, IPA, and tempranillo/grenache blend, those psychedelic goblins would have been quite clearly in play. As for the songs, perhaps because he comes from a folk, rather than blues, background, Thompson seems to avoid the trap of defaulting to variations on a 12-bar blues whenever stuck for a tune (step forward, Messrs Dylan, Clapton, Page, Hendrix, and pretty much every other member of the Serious Rock God pantheon, and on down to mere mortals – your blog stands guilty as charged). This had the disadvantage for the first time hearer of there being no standard musical tropes to hang on to, so the more straight-up rockers like ‘Patty Don’t You Put Me Down,’ in the first encore, stood out more than others. First, though, there was a duet on ‘That’s Enough’ with his support band, the Rails, the band that features James Walbourne and Kami Thompson, his and Linda’s daughter. His duelling solo with Walbourne – no mean guitarist himself – showed why he’d won the Orville H Gibson award in 1991 for best acoustic guitar player. After that, according to the setlist, he was mixing new material with older favourites. Backed by only the high visibility bass player and one of the sexiest (in every sense, I’m reliably informed) drummer ever, the resulting sound mix was outstanding. It was noteworthy, too that his guitar was enough, even unadorned by multiple effects (take note, indie guitarists who have pedals that make it sound like a Hawker Harrier Jump Jet taking off) – a bit of flanger, maybe, or chorus, thickening the sound a bit, but in general, just a clean cascade of brilliance that you just didn’t want to stop. Onstage, Thompson was a genial, laconic presence, dealing gently with the random shouts from audience members (those beta blockers had started to kick in nicely, obviously). Highlights for this blog were ‘Sally B’ (which I had mondegreened into ‘Salad Brie’) ‘Broken Doll,’ ‘I’ll Never Give It Up,’ ‘Wall of Death,’ and, finishing the set, ‘If Love Whispers Your Name,’ probably the stand out for me. It has a beautiful, elegaic quality to it: all the elements of a great song were there, with the melody creating the mood for the lyrics – the story of a relationship’s end – and Thompson’s guitar work adding, elaborating, augmenting, and underlining the passion in his vocal. After that – and a standing ovation from a gobsmacked audience – there was time for not one, but two encores. Again, note for younger bands: if your crowd is still clapping that loud, come out a second time. It makes them feel just that little bit special. And this was that little bit special. Even without the psychedelic goblins. (1) tip for reviewers: if you haven’t discovered already, setlist.fm is a fantastic resource, telling you what you listened to the other night at the gig. Indeed, the setlist listing for this gig even has links to all the songs – fantastic! For Edinburgh RT fans: if you’re reading this before 19th September, and can stand mere mortal guitar playing, your blog is one half of Tribute to Venus Carmichael’s gig at the White Horse, Canongate, EH8 8AA on Saturday 19th at 8 pm. For more info, slide over to the sister site to this blog, tributetovenus.com. Here endeth my advert. Anything below this line is WordPress’s work.